The Triple Combo is the best of all possible worlds: 3 Family Packs and 3 Defender Packs. By balancing these two varieties, you get the nutritional benefits of both packs while adding to the variety and long-term enjoyment of your meals. When the time comes to rely on your stored food resources, you'll be glad you decided to choose the widest variety of menu options — to help you thrive, and not just survive. Protect your family's long-term well-being while locking in affordable prices, before a natural or man-made event creates the potential for food shortages and hoarding. 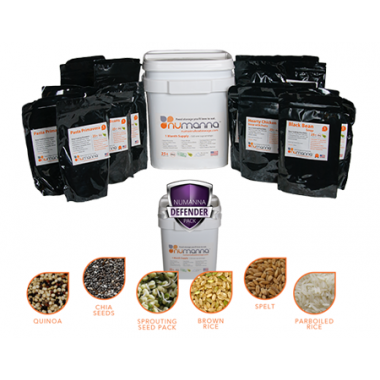 This Package contains: 3 Family Packs and 3 Defender Nutritive Packs.